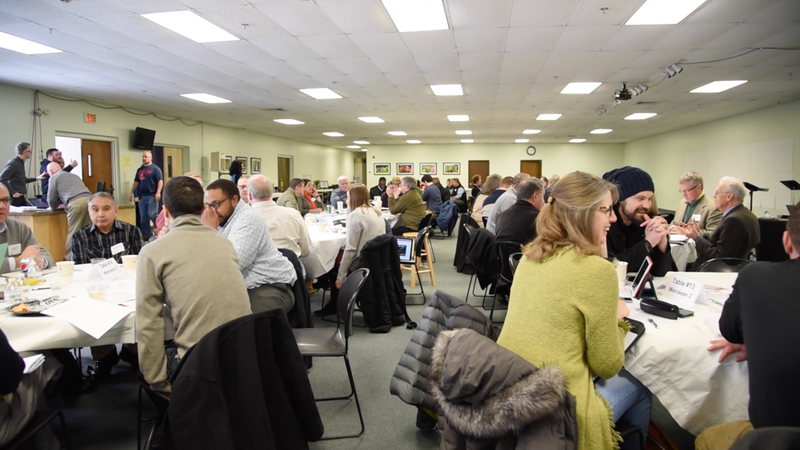 The New England City Forum brought together 103 Christian leaders from across New England to learn from each other, develop deeper relationships, and ultimately increase effective ministry in each of our cities. We met on February 16, 2017 at First Assembly of God in Worcester. The New England City Forum is sponsored by the Emmanuel Gospel Center (Boston), Vision New England, Greater Things for Greater Boston, and the Luis Palau Organization (who bought us lunch!). The New England City Forum is linked intentionally with Vision New England’s GO Conference, which this year was February 17 and 18 at the DCU Center in Worcester. Jeff Bass and Liza Cagua-Koo from the Emmanuel Gospel Center shared a Powerpoint Presentation about the complexity of effective ministry. God’s work in a city is hard to understand because we often don’t see important things, nor do we interpret what we do see effectively. Because different people see things in different ways, and our biases interfere with our seeing and our understanding, we will be more effective in ministry if we can look and interpret together. This points to the importance of strong, diverse relationships within our ministry teams, and across our collaborative networks, as we work together to advance the Gospel in our cities and regions. We heard stories from Worcester, MA; Portland, ME; New London, CT; and Rhode Island. Here are some highlights of what we learned from the various presentations. The second-largest city in New England, Worcester is an ethnically, racially, culturally and socio-economically diverse urban center where the church is starting to leverage the strategic opportunities presented by its diverse community. Although historically a more siloed and isolated city, here Christians are coming together to serve their neighbors. 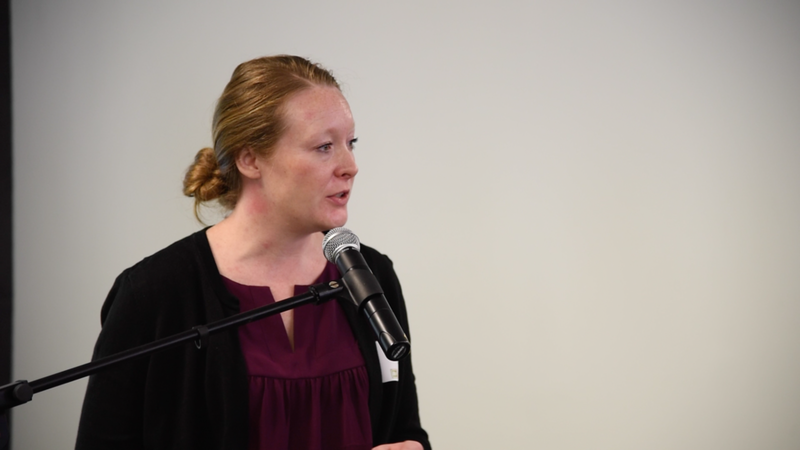 The Worcester team highlighted collaboration efforts around Christian sober house "Turn The Page" and the work of Worcester Alliance for Refugee Ministry (WARM), which connects urban and suburban churches together to welcome the city's incoming refugee neighbors. In fact, Worcester has the highest number of refugees of any city in Massachusetts. Ministry efforts in Worcester are undergirded by Kingdom Network of Worcester, which is a strong inter-denominational prayer movement, and John 17:23 pastoral support groups. The group compiled a handout describing an overview of the history of God's work in Worcester, its current challenges and opportunities. Portland's presentation highlighted the rising percentage of church attendance: older churches are being revitalized and new churches are being planted. These churches are strengthened through the Mission Maine pastors group which meets monthly to collaborate in mission and fellowship. Ministry in Portland is characterized by strong compassion-based ministry. To address the drug/opioid epidemic, the Root Cellar community center provides after-school programs, food, and clothing. Portland also has a large percentage of immigrants, and the largest number of asylum-seekers in New England. Churches have come together to help the immigrant community through trauma and marriage/family counseling, individual discipleship, language instruction, and legal services. Additionally, a team of street pastors from various churches are sharing the gospel with folks on the street, and they have seen a decrease of 70% of crime in the neighborhoods where they have been serving! CityServe eCT is an informal network of churches and ministries united to proclaim the gospel in word and deed through collaboration for prayer, outreach, and service. With a 40-member team of ministry leaders and no paid staff, they have come together for a variety of efforts including: restoring Fulton Park; hosting a CityFest festival in the park (attended by 1,200 with 90 people taking steps of faith); through a "Love 146," training of staff in motels to recognize signs of trafficking and child exploitation; developing a team of police chaplains; and coordinating a multi-church vacation bible school. Many more joint initiatives are planned for the coming months. Check out their Powerpoint and Notes to learn more! 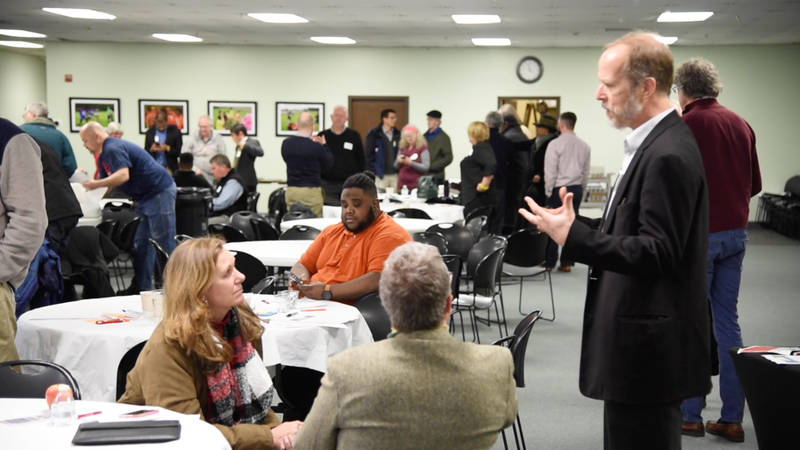 Inter-church collaboration in Rhode Island began with approximately 100 pastors participating in prayer summits and monthly pastors’ breakfasts. This led to a desire to work together, and the organization Love Rhode Island emerged, which encourages churches to pray for people, to care in practical ways, and to share the good news of Jesus. Love RI held a large citywide gospel festival in 2010 that was attended by over 100 churches. They also began to bring together entire congregations for prayer through People’s Prayer Summits. In 2013, the Summer OFF (Outreach, Friends, and Faith) program developed, which is a vacation bible school on wheels with 13 churches, bible stories, free lunches, and crafts. Then, in 2016, the Together initiative trained pastors and leaders in servant evangelism, intercession, and church planting. This ministry is now launching “Together we Pray,” 35 churches engaged in 24/7 prayer for the region. Learn more with their Powerpoint and Handout. A key feature of the forum was table discussions, which gave participants a chance to share their perspectives, reflect with other leaders from their cities and together gain deeper insight. Each presentation concluded with questions for leaders to digest what they are hearing and how it applies to the unique ministry environment in their cities. In the last part of the day, participants engaged in a large-group processing and sharing exercise to determine the key learnings that were emerging throughout all the cities. Through "flash hexagoning," individuals responded to the question “What have you learned today?” on sticky notes, and then shared these with their table. The table then grouped responses by common themes and chose up to three overarching key learnings to be highlighted for the entire room. 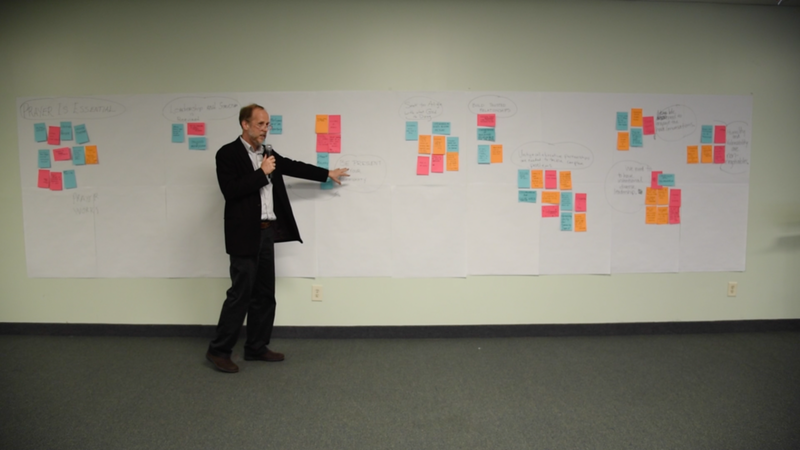 Each table's key learnings were written on larger sticky notes, which were then themed on the wall by the large group. Ten key insights emerged, which we used to focus our concluding prayer time for God’s continuing gospel movement throughout New England. 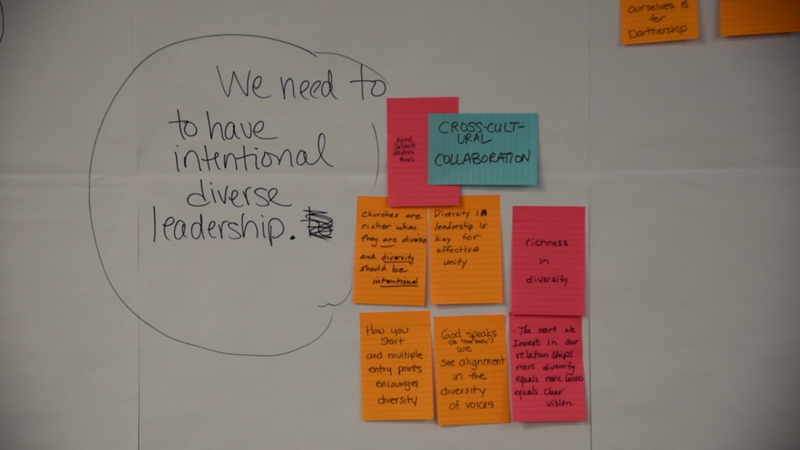 The ten key principles from the forum are stated below, with select, undergirding sticky notes in quotes and additional insights from day-long notetaking at the tables. Praying together is the foundation of a gospel movement, and "precedes an environment of collaboration and love." "Commnunity-based prayer launches community action." It is no surprise that many of the cities with strong Gospel witness also had a strong inter-church prayer network across denominations. Truly, we can’t expect the Holy Spirit to move in our cities without unified prayer. "Effective moments require engaged and available leadership." "A structure is needed to capture and accelerate partnerships." Pastors are often the gate-keepers for collaboration; if they don’t know other pastors, then churches won’t work together. "Training of pastors/leaders" is key. At the same time, we need to restructure the current church system so these initiatives are not entirely placed on the pastor. There is much momentum around training congregation members working in secular fields to disciple people in their occupations to further the kingdom of God. To this end, pastors in Hartford have been discussing a Kingdom in the Workplace conference to help people network across churches vocationally. Needs within cities are ever-changing: we must become multidimensional in our thinking and approaches to serve our communities. Initiatives should be birthed through the assets and needs in the community, so that ministry is transformational rather than transactional. "Understanding demographics for Gospel impact" by tuning into the "kairos opportunities" presented by who is in or coming to a city--through immigration, refugee resettlement, etc. There is a lot of momentum throughout New England around refugee ministries, and God is bringing us an opportunity to engage the nations through the refugees among us. A "ministry of presence" is key, and upon this foundation events can be leveraged--we must "prioritize presence over events." Church leaders are continually seeking to find a good balance between initiating collaborative events and adopting a consistent ministry of presence-- a dynamic that plays out not just when a church engages the community, but also when churches engage each other. All of the great gospel movements are happening outside the four walls of the church. Leaders in Portland have found that the less church-centric and the more sent out into the neighbors a church can be, the better. Rather than just starting new things, leaders should find things that are already happening and join in, asking “How can we be a part of this?” This curious, open, discovery-oriented approach identifies and celebrates where "God is at work," and enables us to see our ministry within God’s bigger picture. Leaders across New England continually attribute gospel movement to strong, trusting relationships between leaders. God speaks to many people at once - we can only discern what God is doing by being in relationship with one another. Developing authentic relationships that cross traditional boundaries and divisions is also key, but taking time to build trust cuts against our natural proclivity for “productivity.” However, trust-filled relationships make #7 (below) possible, and are also the basis of #8. At least nine cities honed in on the importance of collaboration: collaboration is not just an optional goal for ministry, it is essential for united and effective gospel witness. Cities are complex, and churches miss major opportunities when they do not see secular/governmental organizations as potential allies, rather than obstacles. Boston has seen the incredible value of intentional partnership between churches, community organizations, and social service agencies within small geographic regions of the city. In Portland, church leaders have come together to serve the refugee population and address the drug crisis, complex situations that are too big for any one church to tackle. Leaders in Worcester describe the need for some kind of clearinghouse that brings us together and helps to coordinate our prayer, witness, and service. Churches and ministry efforts are richer when they are diverse because more diversity equals more lenses, resulting in a clearer vision. We need to get outside our cultural and denominational bubbles in order to gain insight on our own stereotypes and biases, so we can see God and others more clearly, as well as our part in what He is doing. Pursuing diversity in any context (church, leadership, collaboration) needs to be intentional and it is not going to happen naturally. Churches in Cambridge have found that diversity is built through food, friendship, and giving voice to people at the table. Who is at the table when something starts often means that the starter group ends up being the decision-makers, so having multiple entry points where new people at the table can co-create, not just "follow," makes functional diversity more likely. New London: Leaders in New London were encouraged by Worcester’s model of two churches collaborating to run a sober house together and are exploring implementing this in New London. They are also considering starting a free arts and crafts in the park once/week during the summer. 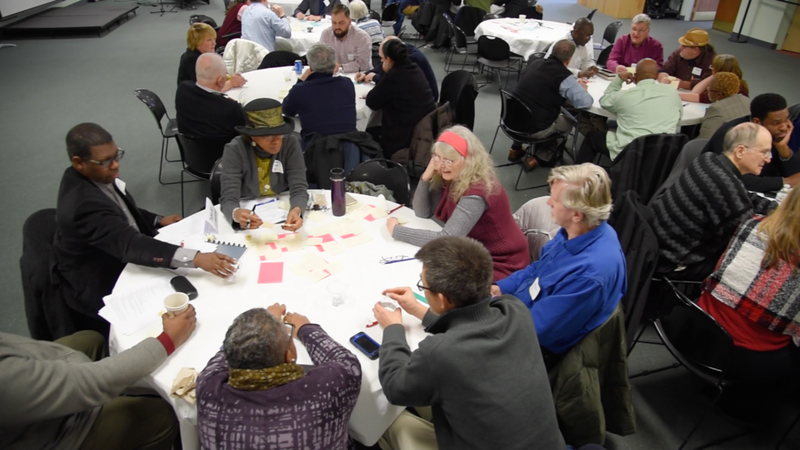 Rhode Island: Based on the New England City Forum conversations, leaders in Rhode Island thinking about how to rebrand their movement towards the “Together” terminology, developing a sub-area strategy using the NH Alliance as a model, and continuing to develop the 24/7 prayer network. Connecticut: CityServeeCT is now working to invite more than 100 additional pastors to their monthly meetings and rotate the meeting location between cities. Maine: Leaders in Maine are considering implementing a street pastor’s ministry in Lewiston and how they can respond well to immigrants in Portland. Hartford: A pastor's luncheon is taking place on March 30th to consider how to foster greater unity and relationship among diverse leaders in the Urban Alliance Network. Worcester: In a follow-up meeting, Worcester church leaders discussed the need for their team to represent the full racial, ethnic, gender and denominational diversity of Worcester. They are also considering how to nurture better church/community collaboration through focused research, a street pastor's ministry, and local school partnerships.